A Quilters Dream Batting Primer! › A Quilters Dream Batting Primer! Wow! To say my blog has been long neglected would be a gross understatement. Here I am though-ready to start fresh! 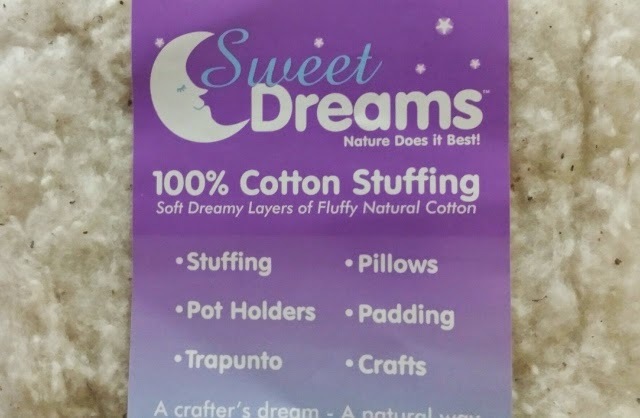 This photo is of the amazing Cotton Stuffing produced by my friends at Quilters Dream Batting. They do not sell directly to consumers but through quality quilt shops both online and storefronts. Having used all the battings available here in the US, they are my hands down favorite. The quality is ALWAYS there and they have the most amazing customer support staff. On to the useful information-I am often asked which batting to use in a given project. The choices can be overwhelming. There are cottons, polys, poly blends with cotton, silk, wool, recycled green battings, and midnight black poly battings. These days there are even battings with fusing attached to make projects super easy.People often believe that the choices reflect the quality of the batting. In Quilters Dream Battings, this is not the case. Rather, the choices represent the weight of the lofts. Each of the battings listed below is connected to a link on the Quilters Dream site that may have additional information you may find useful. All of the quilters dream products can be purchased on my site. request-this is the lightest, thinnest of the lofts available. This weighs about 3 oz/square yard and is 1/16" thick. select-this is the mid loft batting. This weighs about 4 oz/square yard and is 3/32" thick. deluxe-the loft becomes noticeably heavier here. This weighs 6 oz/square yard and is 1/8" thick. supreme-this is the thickest of the cotton lofts and weighs 8 oz /square yard and is 3/16" thick. request-this has the same thickness and weight as the cotton request. select-this has the same thickness and weight as the cotton select. deluxe-this has the same thickness and weight as the cotton deluxe. Quilters Dream Puff Batting-A fluffy light batting. This batting comes in only one weight 3 1/2 oz/ square yard and is 1/3" thick. Quilters Dream Midnight Poly Batting (Black)-This now comes in only one loft-select and weighs 4 oz/ square yard and is 3/32" thick. Quilters Dream Orient (a personal favorite of mine)-this is available in only one loft-select and weighs 4 oz/square yard and is 3/32" thick. Quilters Dream Wool(this is AMAZING wool! )-this beautiful wool weighs 3 1/2 oz/square yard and is 3/8" thick. Quilters Dream Fusion-This wonderful product is available in Cotton Fusion or Poly Fusion and in two lofts-Request and Select. The weights are comparable to the select cotton with similar thicknesses. This is a solvent free fusible batting! So your choice here is do you prefer cotton or poly and thinner or slightly heavier. Quilters Dream Green Batting-This batting sometimes strikes fear in people. (totally unnecessarily i might add ). It is made from recycled green plastic bottles and it is so soft you will be totally stunned. It is the palest of green shades and works so nicely in any project. Its weight is similar to the request cotton, as its thickness. Quilters Dream Blend Batting-This is a 70% cotton, 30% poly blend of fibers and is a delight to sew on. This comes in only one loft and weighs 5 oz/square yard and is 1/8" thick. Last, but certainly not least, is the fantastic Sweet Dream Stuffing! This product, made from luscious 100% cotton fibers is 18" wide and 120" long when unrolled.